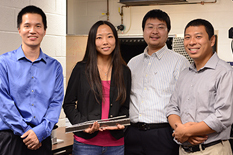 UMD research team (from left to right) Haijun Liu, Miao Yu, Yongyao Chen and Hyungdae Bae. University of Maryland (UMD) A. James Clark School of Engineering researchers have developed breakthrough technology to improve sound sensor capabilities through the use of artificially engineered materials. Sound, or acoustic sensors, play important roles in a wide range of uses. From sonar navigation and detection to medical imaging for cancer and therapies, sensors are an important part of daily life. However, current sensors, like ultrasound for tumor detection or sensors monitoring a bridge's structural health, are limited in their ability to detect weak acoustic signals. These weak signals fall outside of most sensors' minimal detectable range, so extremely small tumors or fine damage in a bridge's foundation may go undetected. This year, sensor limitations also made international news as underwater sonar attempts failed in the deep waters of the Pacific to locate signs of missing Malaysian Airlines Flight 370. Led by Department of Mechanical Engineering Associate Professor Miao Yu, the UMD researchers are addressing current sensor limitations by developing new uses for artificially engineered materials—metamaterials—to improve acoustic sensing capabilities. Nature Communications published the team's breakthrough research, "Enhanced Acoustic Sensing through Wave Compression and Pressure Amplification in Anisotropic Metamaterials," in their October 15 issue, and it is the first research to use metamaterials for improving acoustic sensing. 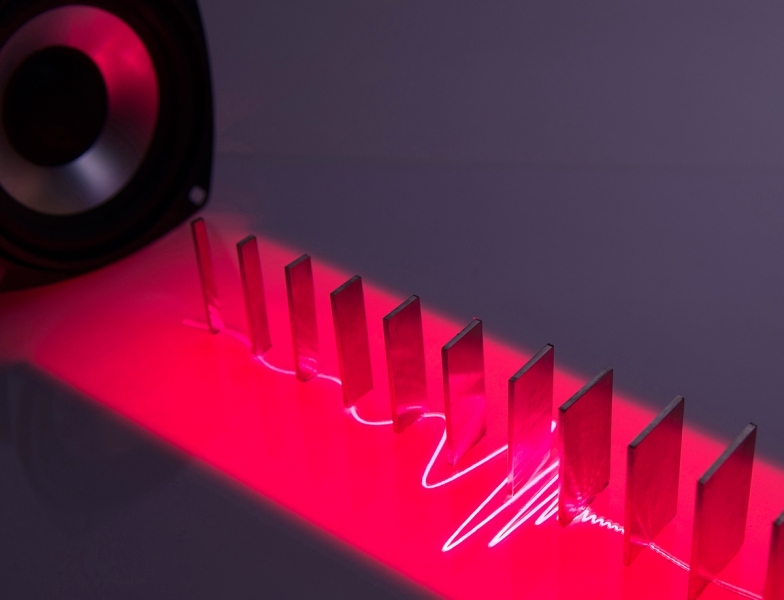 While researchers have explored using acoustic metamaterials for applications such as invisible cloaking, sound isolators and acoustic absorbers, Yu's team is the first to show how metamaterials can alter sound waves to improve sensor detection. The UMD team has created a new sensing platform that uses acoustic metamaterials—artificial materials specifically designed to manipulate sound waves—to enhance acoustic detection. The team developed a metamaterials structure that would compress and amplify a sound wave before detection by a sensor. This compression and amplification process, in effect, 'concentrates' the sound wave into a range the sensor can detect. The system allows a sensor to pick up weaker, or low volume, signals that previously would have gone undetected. Metamaterial enhanced sound signal detection could advance sensor technologies in many applications, such as acoustic navigation, communication, surveillance, structural health monitoring and medical imaging. For example, improved medical imaging sensors could possibly detect tumors and cancerous growths at an earlier stage, while improved underwater sonar sensors could help locate objects from a greater distance or depth. Yu's research is part of a three-year National Science Foundation funded project in the Division of Civil, Mechanical and Manufacturing Innovation (CMMI) to investigate acoustic wave control using metamaterials. Her team includes Research Associates Drs. Yongyao Chen, Haijun Liu and Hyungdae Bae, and Undergraduate Research Assistant Michael Reilly. Schematic of metamaterial enhanced acoustic sensing. Left: the pressure field of sound is spatially compressed and amplified inside the high refractive-index acoustic metamaterial before detection by a sensor. Right: schematic metamaterial dispersion curve for acoustic waves with a high-k state. For more information on Yu and her research, visit her faculty webpage.